A Small Size, Colorful, Visibly Aged And Early Flaked, Well Made Paleo Point That Exhibits Surface Sheen Aging And Overall Stone Coloration Patination, Overall Aged River Polished Surface, Correct Early Parallel Style Flaking, Correct Material And Manufacture For The Area Found. Found By Mike Millsap Below The Eufaula Dam On The Canadian River. Purchased By Ken Partain From Melina Millsap At The 2017 Oklahoma Indian Artifact Show In McAlester, Oklahoma. 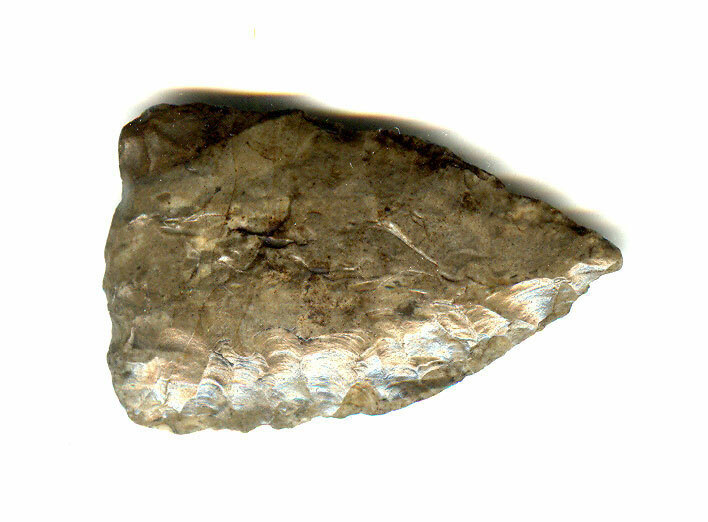 This Nice, Unusual Paleo Period Example, Has Cody Complex Flaking And Style, And Possibly Related To The Scottsbluff Points. Includes Dwain Rogers And Ken Partain Certificates Of Authenticity.